John Smoltz has pitched his entire major league career with the Atlanta Braves, but he is on the verge of a deal with the Boston Red Sox, according to sources. 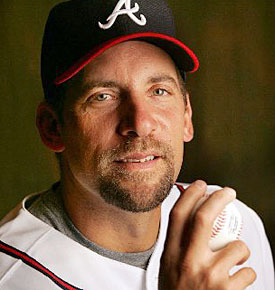 Smoltz, 41, has pitched in 708 games for the Braves, winning 210 games and earning 154 saves. He has been been rehabilitating his shoulder since having surgery last season, and there have been reports that the has made excellent progress. Smoltz’s departure from Atlanta would come in a winter in which the Braves have struggled to fill holes in their rotation; Atlanta was unable to land Jake Peavy, after extensive trade talks, and was unable to sign free agent A.J. Burnett. Despite the qualifiers, AJC is reporting it as a done deal. The Braves are shocked. John Smoltzâ€™s career with the Braves is ending. The iconic Atlanta pitcher, whoâ€™s recovering from June shoulder surgery, has agreed to a contract to pitch for the Boston Red Sox and will likely inform the Braves of his decision today, a person familiar with the situation confirmed. Smoltz, who contacted Braves players Wednesday night to inform them of his decision, has said many times in the past year that he wanted to finish his career with the Braves. However, the team had not offered a major league contract to Smoltz that was anywhere near the amount that the Red Sox have reportedly guaranteed him. The Braves were expected to go no higher than $3 million guaranteed, regardless of other offers he got. â€œJohn is a great guy. He follows his own head, and I just donâ€™t know whatâ€™s going on with him right now,â€ Braves Chairman and CEO Terry McGuirk said today. â€œWeâ€™ve offered less of a guarantee, but weâ€™ve offered a substantial guarantee. Coming off an injury like this, we feel like itâ€™s the right thing that we should be doing (in regards to our offer). â€œWeâ€™ve offered him a package that would get him in the $10 million range, if he were to pitch a full season and pitch well. For him to walk away from that and to go to another place, Iâ€™m just shocked and surprised. According to a person familiar with the situation, Smoltz would have been required to pitch 200 innings next season to reach the maximum incentives in the Bravesâ€™ offer. Incentives in the Red Sox proposal are more easily attainable. One can’t blame the Braves, who have a much more limited payroll than the Sox, for hedging their bets on a player who has been constantly injured in recent years.Â Nor, really, can fans blame Smoltz for preferring $5.5 million to $3 million as his career winds down.Â Still, it’s a shame to see him play in another uniform.